A small sample of the cartoons submitted to the Israeli Anti-Semitic Cartoons Contest. Courtesy of Amitai Sandy. Clad in a red track jacket, Amitai Sandy, 29, sits in his Tel Aviv bedroom and sifts through anti-Semitic cartoons sent to him by e-mail. He clicks on one computer file at random and up pops the image of a fanged, ultra-Orthodox Jew draining the lifeblood from Saudi Arabia. But rather than taking offense or looking for a foreign embassy to burn down, this comic book publisher, self-declared "extreme leftist" and all-around artist provocateur just cracks a smile: After all, he was the one who commissioned the hateful caricature, and dozens like it, in the first place. "The cartoon is ridiculous, it's mocking stereotypes," Sandy explains, noting its crudeness — how the map seems to be drawn by an arthritic hand, how the forehead of the Hasid must be stamped with the word "Zion." Another caricature sent to him spoofs the Passover blood libel, which, though originating in medieval England, had a disturbingly long shelf life in Europe. Specifically, the anti-Semitic legend accused Jews of baking the blood of murdered Christians into matzos, or unleavened holiday bread. In the satirical version of the libel, a daycare center for Christian kids really hides a matzo factory complete with smokestacks, conveyor belts and a wire fence shaped like a Star of David. In the foreground, a Jew donning a black hat — presumably the factory owner — gives an evil grin and says, "Hello, children." And that's the whole point. Following the decision by an Iranian newspaper to hold a Holocaust caricature contest, Amitai Sandy and his friend Eyal Zusman, 30, decided to answer hate with laughter. On Feb. 16, the two declared an Israeli anti-Semitic cartoon contest for Jewish artists only. They have so far received over 40 submissions. It is hard to imagine that all the death, arson and rioting started because of a doodle. But, yes, the Muhammad comics controversy began in late September 2005, when, as an exercise in free speech, the Danish newspaper Jyllands-Posten ran 12 caricatures — some quite unflattering — of the prophet. Though many Muslims complained that the Danish cartoons depicted Islam as being a violent religion (for example, one drawing showed an angry Muhammad brandishing a scimitar, while another had him wearing a bomb in his turban), European newspapers nevertheless began to republish the caricatures. Finally, in February, mobs incensed by the Muhammad-as-a-terrorist cartoons torched the Danish and Norwegian embassies in Damascus and the Danish consulate in Beirut. Similar religious riots in Afghanistan, Libya and Nigeria have left over 150 people dead. Reminiscent of the lethal fatwa issued against British novelist Salman Rushdie in 1989, a prayer leader in Pakistan's border town of Peshawar even put out a contract on the Danish cartoonists, offering $1 million and a new car to anyone who kills one of them. But a wide-circulation Iranian newspaper Hamshahri opened a whole new front in this bizarre clash of cultures when it decided to retaliate against the European media by running its own cartoon contest. The target of ridicule? The Holocaust. That's when cartoonist Amitai Sandy and screenwriter Eyal Zusman decided the world needed a reality check, so on Feb. 16, they organized their own anti-Semitic caricature contest: "We'll show the world we can do the best, sharpest, most offensive Jew hating [sic] cartoons ever published!" boasted Sandy on his Web site. "No Iranian will beat us on our home turf!" The deadline for submissions is March 5, and the two artists promise that the best works will be exhibited in Tel Aviv. Sandy began his comics career at age 18, when he took over as co-publisher for Perversions of the Penguins, the now-defunct Israeli underground magazine whose pages featured such artists as Dudu Geva and the Actus Tragicus group. "It was mostly nonsense humor, but there was social commentary beneath the surface," says Sandy. "We used phony names because I was in the army at the time. I was 'The Sandwich.' "
Four years later, in 1998, the 'zine made it as a comic strip in the weekly Ziman Tel Aviv, and the new format allowed for timely political statements. The strip lasted for two years, and Sandy has since moved on to other projects, such as the graphic novella Shirley, but he has not lost his edginess. In November, he participated in Three Cities against the Wall, an artist protest organized in Tel Aviv, New York and Ramallah against the controversial security barrier Israel is building in the West Bank. For the event, Sandy produced a poster depicting a smiling Jewish-Arab couple with the slogan, "Yes, I f-ck Arabs." Amitai Sandy explains the concept: "Whenever there was a left-wing demonstration in Israel, right-wingers would go by and shout, 'You f-ck Arabs,' so I thought, 'Why not turn this around and make it a point of pride?' "
It's the same sort of subversive humor that he has applied to the ongoing Israeli anti-Semitic cartoon contest. "We feel that a strong person can laugh at himself, not at the other person," he says. So far, this weird anti-Jewish art contest has received over 40 submissions, including four from Avi Katz. An illustrator for the biweekly Jerusalem Report and creator of the comic strip Virtuella, Katz first heard about the competition by way of a pro-peace e-mail list and was eager to participate. "I think it's funny. I think it's noble. I think it's the right answer to anti-Semitism," he states emphatically. One cartoon submitted by Katz, entitled "Pinchas and Jamila," is based on the old Punch and Judy puppet show and is really a dig at settler brutality. Dressed in a plaid shirt and orange yarmulke (the color worn by those opposed to the Israeli withdrawal from the Gaza Strip), Pinchas threatens a tiny Palestinian girl, Jamila. All the while, an Israeli soldier looks the other way. "After it came out in The Jerusalem Report, someone wrote that the cartoon was anti-Semitic because Pinchas had a big nose," says Katz. He didn't agree, explaining that Punch, on which the settler is modeled, traditionally had a big nose, but Katz thought that if someone had found it anti-Semitic, perhaps he could slip it into Sandy and Zussman's contest. 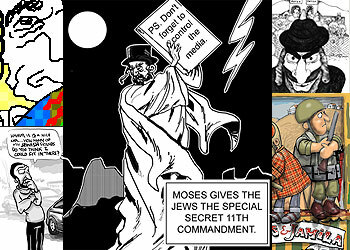 Though the cartoons are clearly ironic — such as the one with Moses giving the Israelites the secret Eleventh Commandment ("Don't forget to control the media") — and they are all drawn by Jews, the Anti-Defamation League of Bnai Brith is not amused by the competition. An official in the American group's Jerusalem office described the contest as being "in poor taste and exploitative." "There are enough anti-Semitic cartoons coming from the Arab-Muslim world," he added. "We don't need anymore." Ironically, someone who did find the contest funny was Deborah Lipstadt, the Holocaust Studies professor at Emory University who, in April 2000, won a libel suit against revisionist historian David Irving. Lipstadt had proved to a British court's satisfaction that Irving consistently twisted historical data to suit a racist and anti-Semitic ideological agenda. Irving was forced to pay Lipstadt's legal costs, and Holocaust denial suffered a resounding public defeat. "Deborah contacted us right at the beginning about a week ago," says Sandy. "We were surprised but, of course, we accepted her offer." However, a few days later, the professor had second thoughts. In her blog History on Trial, Lipstadt writes that she first viewed the Israeli competition as an ironic send-up of the Iranian contest, but with Arab and Muslim news outlets announcing their intention to run the anti-Semitic cartoons, she now feels that the point of the cartoons will be lost. "This is being used by others for wrong purposes," she concludes. "I urge the organizers to cancel the contest." Sandy is disappointed by Lipstadt's dropping out, but he says that he is not worried about someone misusing his project. "The hate-mongers don't need me to come up with cartoons," he says. "They have been doing it for hundreds of years." View the Worldpress Desk’s profile for Erik Schechter.